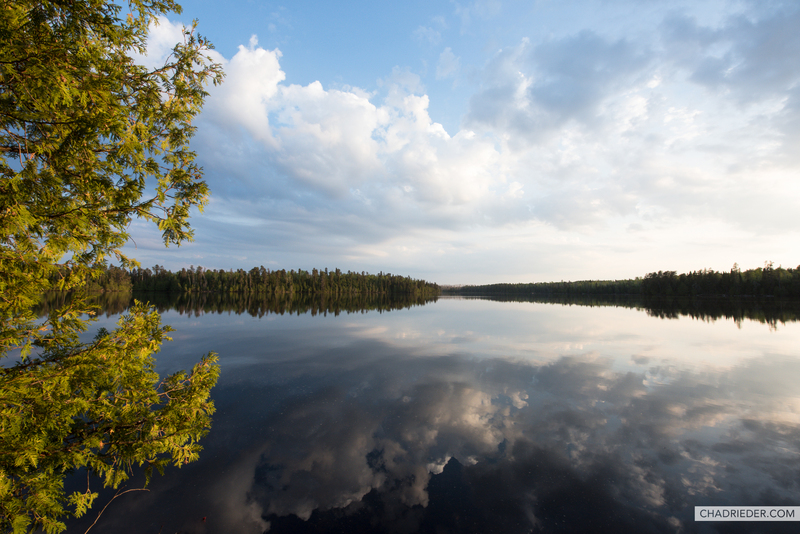 May is an unpredictable month in the Boundary Waters. Some years you will run into snow and ice, while other years the temperature could be in the 80s. After a cool and successful bug-free trip up the Lady Chain in May of 2014, my pal Kortney and I thought we’d try our luck again in 2018. The rare April blizzard that blanketed parts of Minnesota with over a foot of snow had us concerned, but the hot weeks that followed melted the BWCA lakes just in time for us to enter on Thursday, May 24. After deliberation, we narrowed down our entry point to a couple of options. We ultimately decided that Entry Point 37 at Kawishiwi Lake would give us great base camping options and the ability to explore new areas both of us had yet to see. It was the correct decision, and it ended up being one of my favorite BWCA trips to date. We were on the road out of Minneapolis just after sunrise and arrived at Kawishiwi at noon. The sky was overcast and a very light rain fell once the canoe was loaded. Kawishiwi is my favorite lake in the BWCA and it was so nice to see her again as we paddled off with the excitement of the unknown filling our minds. Once we pushed into Square Lake, the remnants of the 2011 Pagami Creek fire were evident and Kortney and I were both in new territory. The lake was scorched with spindly black pine trunks remaining along its shores, and the underbrush bright green with new growth blooming everywhere. As the trip went on, we referred to these burn areas as the “dead zone”. We paddled up a narrow creek shored with huge grey rocks and soon were on our first portage to Kawasachong Lake. Kawasachong was also in direct path of the burn and was not an attractive lake to see with downed blackened trees everywhere. The winds came up a bit as we paddled north to the long 189 rod portage to Townline Lake. When we landed we both snacked and drank a lot of water before the real work began. My backpack was fully loaded with camera gear and enough food for five days. I volunteered to portage the canoe with my pack and we rocked the hike in one trip which saved us a lot of time. Our goal was to reach Lake Polly in hopes of finding one of the best sites available before the busy holiday weekend. After zipping through Townline and the next portage, we finally found ourselves on the south end of Lake Polly. She was beautiful. As we paddled, I commented that Lake Polly had a great vibe. The lake looked healthy with a dense green shore of towering pines and we pushed north and then northwest until we came upon a big island campsite in the center of the lake. It was available and we were giddy as we walked around and explored this beautiful campsite. Since I knew there were a couple other popular sites nearby, we took a quick paddle to check them out. The next island to the north was occupied and we could see another open site from the water. We immediately decided to head back and take the original island site we visited. We paddled hard against the wind and set up camp after a five hour drive and three and a half hours of paddling and portaging. This site would be our home for the next several days and it was perfect. That night we grilled seasoned steaks and potatoes with peppers over a wood fire. It was a great way start to the trip. The overcast sky burned off leaving feathery light clouds for sunset and we hit the water and explored the central part of the lake, paddling around until after dark before heading back to camp to start a fire and plan our next day’s adventures. Since we had such a prime spot, we decided to hold down camp and explore the other adjacent lakes during the day. To the north of us was Koma Lake and then Malberg. We were paddling at 10am and as soon as we got around our island we saw two heads in the water. It was a female moose and her calf swimming to the island next to ours. We paddled hard to get closer, and watched them reach shore and wander into the woods. Since moose numbers have dropped in Minnesota over the last decade, we were ecstatic to see them. Great timing! It was a perfect day with huge white clouds moving by and the sun breaking through. We portaged and paddled into Koma Lake, then north into Malberg Lake. On the Malberg side of the portage we were happy to see a large set of beautiful rapids. We spent nearly an hour there before venturing out on Malberg. Since it was early in the weekend, we only saw two other boats out on Malberg. We took our time and checked out some campsites and the long narrow arm that goes to the northeast before turning around and heading back. When we reached our campsite, the Bota Box wine tasted refreshing and we made a late dinner and explored the island before heading out for another sunset paddle. That night a quick and heavy thunderstorm moved overhead and woke me, but I fell back to sleep again quickly. The next day we paddled and portaged east up the rarely traveled Phoebe River to Hazel Lake. It was overcast and sprinkled rain at times and we moved along leisurely impressed by the dams some busy beavers made that forced us to lift over. We also passed some beautiful merganser ducks and loons before finding our way to Hazel. Hazel Lake was small and round, and had a peaceful presence. We explored the two sites on the lake and stopped at the northwest site for snacks after refilling our water bottles. Kortney and I debated the water quality of the lakes we’d been on and both decided Hazel was the winner. I noted that Malberg was a close second…nerdy camp talk. It was a slow moving day and we pushed back towards the Phoebe River and the skies began opening up with beautiful light. I snapped off some photos of Hazel from the portage and thanked her for the kind experience. The light of the river was dramatically different heading west with the clouds breaking up in the late afternoon. It was dead calm at times and the pine shores reflected magnificently. We took our time admiring our surroundings while pointing out different things we saw along the way. When we finally made it back to Polly, the easterly arm we were on was in shadow but I could tell the main part of the lake over the tree line was starting to light up. I told Kortney, “I think we are about to be blessed,” and I wasn’t wrong. When we made the turn towards the center of the lake the sun broke through directly in front of us and heavenly sun rays pushed through the clouds. We floated for several minutes and took it in while my eyes teared up a bit in the moment. There was spectacular light for sunset and that night we shared lots of laughs around the camp fire before hitting the lake again for a midnight paddle as the skies cleared and stars sparkled bright above. The next morning and we decided to take our time and head out after exploring the southwest stretch of Polly that the Pagami Creek fire touched. I had three cups of coffee and finished most of my food before we paddled to the dead zone. It was a wonderful experience and the lake flowed into a creek with a small waterfall. We beached the canoe and hiked up a small hill with a better view of the area. Tall pine trunks still stood but the underbrush was green and thriving with little trees popping up everywhere. I’m really glad we saw that area. It was after noon when we packed up camp and pointed the canoe towards Kawishiwi. It was extremely hot and sunny and I did my best to shade my face as we paddled. Once again I volunteered to take the long portage, and did so again in one trip but strained me left trapezius a bit in doing so. I was grateful of the small lakes and creeks that followed, and by the time we made it back to Kawishiwi my shoulder was in a lot of pain and the wind was forcing me to use it more than I wished. We took our time and filled our water bottles to take some home before landing back at our starting point at 4:45pm. After loading my Rogue and changing out of the same clothes I’d worn for four days, I looked in the mirror. I was sunburned and my face was covered with streaks dirt. Kortney and I laughed and gave each other a high-five and off we went. It felt like we were moving at warp speed, but when I looked down I was only doing 20mph. This was one of my favorite Boundary Waters trips to date. And it proved once again that following my intuition, having a positive mindset, and allowing things to unfold as they should creates a rewarding experience.